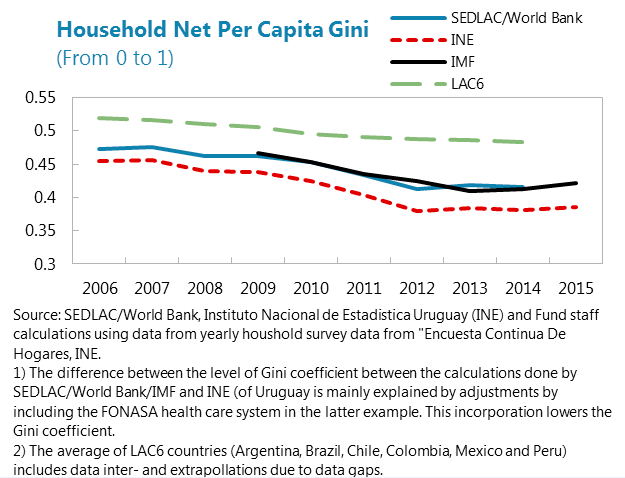 A new IMF report analyzes the lowering of the Gini coefficient in Uruguay during the last six years. Social policies and transfers have played a significant role in reducing poverty and inequality. While income dispersion has decreased across Latin America over the last decade, Uruguay stands out as the country with the largest drop in the Gini coefficient between 2009 and 2014, and to the lowest level. This reflects both government guidelines to bolster low wages, and increased redistribution through income taxes and transfers. However, looking ahead, the positive effects of further redistributive policies may be weighed against their fiscal costs and by a possible trade-off between income compression and incentives for labor supply and education and training. Work incentives among women can be strengthened further via reforms of parental leave, to reduce the remaining gender wage gap, and would diminish future pressures on public finances due to population ageing.